First is this stunning sterling silver ring under the name of "Mermaid Tears". For only £10 -down from £24 - I knew it would be a great purchase that I could wear everyday without it discolouring or leaving a green line around my finger. I am absolutely in love with this ring and have worn it everyday since I received it. It fits perfectly and the beautiful blues, purples and greens shimmer in natural light and reminds me of ripples in the sea...oh and mermaids. However no matter how many times I try, no photo does the ring justice. This exact ring is no longer available but you can buy a very similar one called "Unicorn Tears" but it is not sterling silver and is in the sale down from £16 to £12. 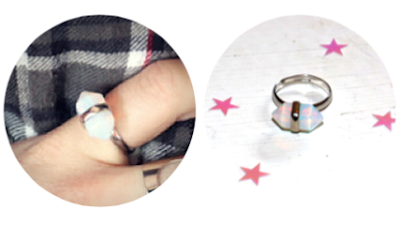 This Daydream Cut-Out ring is at a bargain price of £3! 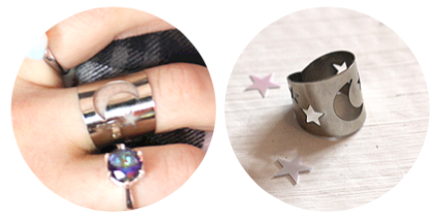 It is readjustable which means you can wear it on any finger you like and I love the fact the moon and stars are cut out and not just engraved. I wear this often alongside my Mermaid Tears ring. Third and final ring I will cover is this Latitude Ring. No photo does this ring justice either as it's not till you see it in the natural light you actually see the colours shine. The ring comes in a choice of 7 stones/colours and I chose Opal so it matched with the necklace I bought which I showed you in part one. 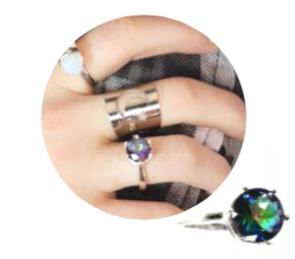 This ring is usually £10 but is only £5 in the sale right now. Moving on I bought these two bracelets. The one with the aztec pattern is called Azure Cuff and is only £10 which I thought was a decent price. 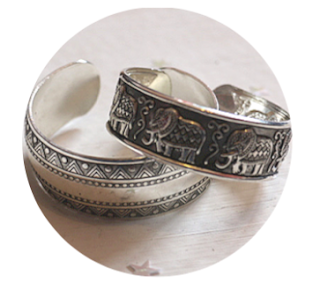 The other one, Nellie Elephant Cuff, is usually £10 but was in the sale for £8 so purchased this one as I knew the two bracelets would go well with each other. Both bracelets are adjustable and as you can see they are silver and have intricate patterns on them. Last but not least of the products I received is this beautiful iPhone case. The case comes in the choice of three different designs which made my decision quite hard. In the end I settled for the centred floral one (named 'Flower' on the site). 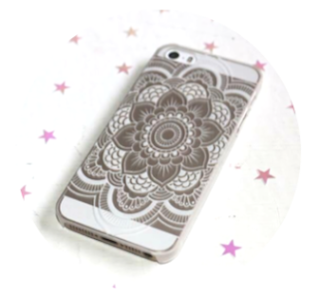 The phone case is available for iPhones 5/5s/5c and also 6/6+. For only £4 instead of £8 it would of been daft not to get one! That brings me to the end of this Boho Moon haul. If you liked any of the jewellery/accessories featured or just fancy having a cyber rummage through what they have to offer you can do so by visiting their store (they ship worldwide!). Unfortunately the code I gave out in part 1 has now expired but Boho Moon always have new coupon codes coming out so keep a look out!